Julian Rosefeldt, Asylum (9-channel film installation) in the Grote Kerk Den Haag (photomontage). From 21 July until 17 August 2012, the Grote Kerk (Main Church) in Den Haag will be renamed the Volkspaleis (People’s Palace). West will organize a multidisciplinary project for a wide audience offering the monumental video installation Asylum by visual artist Julian Rosefeldt, seating units by design atelier ROLU, spoken essays by the writer Maartje Wortel, a concert by the band Santa Cruz, and a reader about ‘super-hybridity’ by Jörg Heiser. Julian Rosefeldt (1965, DE) can be regarded as one the most important video artists on an international level. His work has been included in numerous collections and is frequently shown in renowned museums, all over the world. At Volkspaleis in the Grote Kerk and at West, Rosefeldt’s work will be displayed for the first time in the Netherlands. 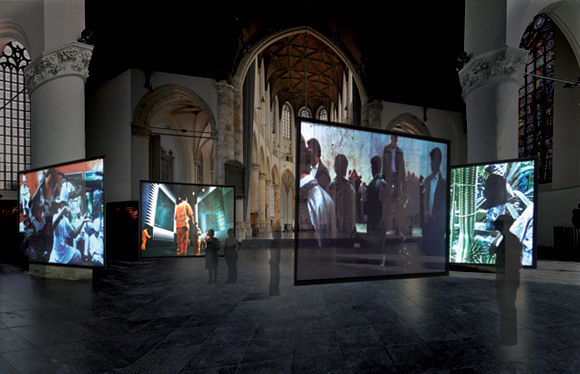 Rosefeldt’s video installation Asylum in the Grote Kerk consists of a life-sized labyrinth, containing nine screens. Asylum (2001) is an installation made by 120 inexperienced actors, mainly asylum seekers. Rosefeldt combines analytic, sober thoughts about the power of the media, with an artistic view. Vacuuming Muslim women in a field full of cactuses, a group of Asian cooks doing useless work in the alienating environment of a monkey enclosure, and newspaper boys who try to keep order in their piles of paper in vain. In those nine contemporary ‘tableaux vivants,’ a deliberate politically incorrect study is carried out about the fear for foreigners, and in turn the yearning for the exotic. The scenes are confronting and cause the visitor to reflect about prejudices and relations with other groups in the population. At West, on the Groenewegje, the complete Trilogy of Failure will be shown. The three ‘multi-screen’ films—The Perfectionist, Stunned Man, and The Soundmaker—display universal themes, such as the absurdity of life and human obsessions. Time and again, the protagonist makes attempts to escape from standards, rituals, and everyday habits, but all in vain. This provides poetic, slapstick-like situations with a cinematic background. The American cooperative ROLU (USA), set up by Matt Olson and Mike Brady, focuses on designing installations, modern city sceneries, and furniture. For Volkspaleis, ROLU will create a new object that is in response to the location: the Grote Kerk. ROLU specializes in the broadening of experiences and wants to take the visitors out of their comfort zone; using their ‘lost and found designs,’ they cause a wavering between the parameters of design and art, and high and low culture. Maartje Wortel (1982, NL) studied Image & Language at the Gerrit Rietveld Academie in Amsterdam. She has published short stories in literary magazines such as Passionate Magazine, De Brakke Hond, and De Gids. Maartje Wortel made her debut in 2009 with a collection of stories called Dit is jouw huis (This is your house) at the publisher De Bezige Bij, and with this collection she won the Anton Wachterprijs, a price for the best prose debut. In 2011, her first novel was published: Half Mens (Half a human being). West has asked Maartje Wortel to write new stories, especially for Volkspaleis. Wortel’s autonomous stories will be available on MP3-players during the manifestation. The music by Santa Cruz (NL) is characterized as the sinister successor of ‘rock legend’ Orange Sunshine. Both bands appeared on the Motorwolf label and they form an integral part of Den Haag underground music scene. On Wednesday 1 August at 9pm, the band Santa Cruz will provide an ‘unplugged’ performance, in which a metal-mantra will be combined with elements of gospel and trance. A modern devotional mass and likewise performance, which forms a perfect match with Rosefeldt’s video installation Asylum. Jörg Heiser (1968, DE) is co-editor of frieze magazine, co-publisher of the magazine frieze d/e, writes for the Süddeutsche Zeitung, and is a frequent contributor to art catalogues and publications. Heiser introduced the neologism ‘super-hybridity’ with a themed issue of frieze magazine (No. 133, September 2010), as a term for the process of accelerating the amalgamation of sources and contexts that feed into artistic production, to an extent that they are atomized and transformed into the seed of the next idea. A new essay on this topic will be published in the context of Volkspaleis.